Remember when you were a kid and you loved festivals and carnivals; the animals, the fairy floss, the entertainment? Well, this longtime couple decided that was exactly the vibe they wanted for their special day. And, although big dark storm clouds threatened to dampen it all, it turned out to be one very colourful, fun and slightly musical affair! “We wanted to combine all the things we loved – animals, music, food and bright colours. We also wanted everyone to be both really involved in our ceremony, and have quite a lot of freedom to wander about. So we ended up with a kind of £wedding festival theme. Corrin wrote a theme tune for the wedding parade and the guests were asked to learn it before the day. 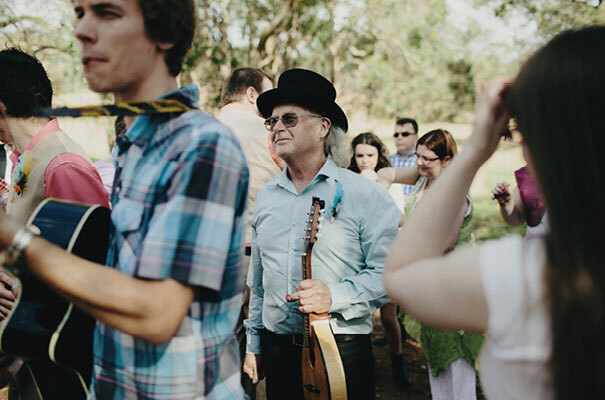 Our wedding favours were percussion instruments, like marracas and tamborines, with the wedding date and our names on them, so guests could play those in the parade too,” Amber and Corrin tell us of the inspiration behind their nuptials. And then there are all those personal touches that make a wedding so unique – the bunting, hand dyed groomsmen shirts, musical instrument favours, corsages and even a maypole! This couple certainly pulled off a fun-filled day to rival all your childhood festival memories.